In the second half of the 1930s voiturette racing became increasingly popular*. As the name suggests, voiturettes were smaller Grand Prix racers; there was a 3-litre limit for the big boys and 1.5 litre for the voiturettes. The spiraling costs of the 3-litre racers and the dominance of Mercedes-Benz and Auto Union made the 1.5 litre class an interesting alternative for the Italian teams. Alfa Romeo's first voiturette racer, the 158 (below), was launched in 1938. When it was announced that the 3-litre category was to be scrapped and the World Championship to be run under the 1.5 litre regulations, work was started on a replacement for the 158 by Wilfredo Ricart and Gioacchino Colombo. 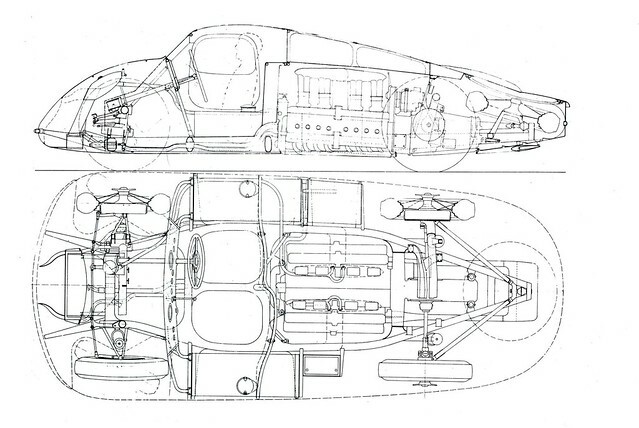 Inspired by the Auto Union racers, Alfa Romeo opted for a mid-engined layout for the 158 replacement. The mid-mounted engine was not the only first for an Alfa Romeo**, the construction of the engine was completely new as well. To lower the centre of gravity of the 512, a completely new flat 12 cylinder engine was fitted (Image below: Ultimatecarpage.com). 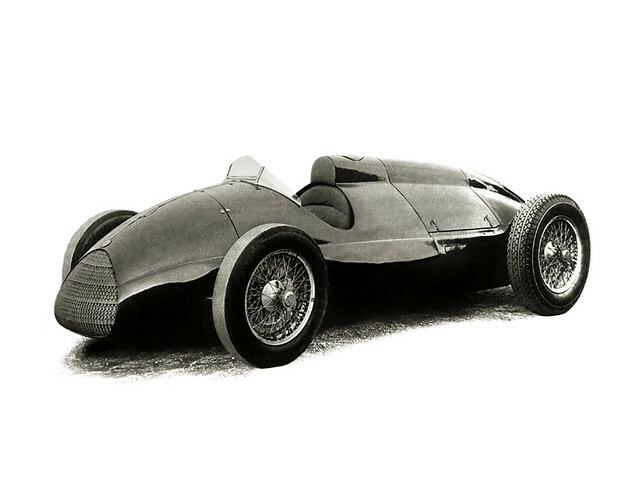 Its stroke of just 54.2 mm was the smallest ever used in a pre-war Alfa Romeo Grand Prix racer. Helped by two superchargers, the 1490 cc engine pumped out an incredible 335 bhp, which was over 200 bhp/litre. Directly bolted on the engine was a five speed gearbox and a DeDion rear axle. The front wheels were independently sprung for razor-sharp handling. Big hydraulically operated drums took care of braking. A first prototype was completed in 1940, but development was cut short by the Second World War. A second chassis was built, but the car was never completed. During test runs at Monza, the 512 prototype piloted by Ricard sped up to 305 km/h. After the War Alfa Romeo started racing again with the 158 and ironically it was the 158 that won Alfa Romeo the first Formula 1 World Championship, for which the 512 was originally designed. Wilfredo Ricart returned to Spain to start his own car company, Pegaso. Colombo left for Ferrari and designed a V12 engine that would be used up into the Sixties. Both 512s are preserved in Italian museums. 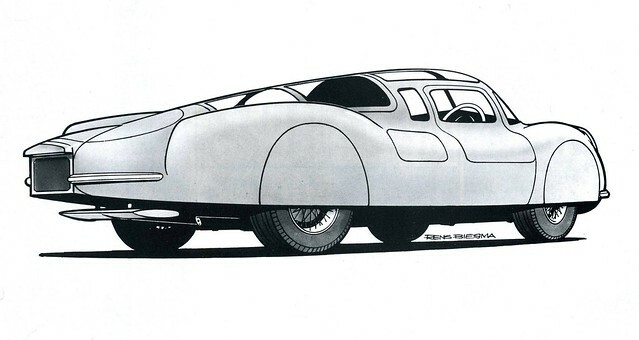 Another mid-engine Alfa concept was the Tipo 163 (above, an artist's impression by Rens Biesma), a street-legal car. It was conceived by the team of Alfa Romeo headed at that time by W.P. Ricart in 1941, around the Tipo 162 GP engine. The 135º V16 3 litre, centrally placed behind the driver, gave some 190 hp @ 7450 rpm devoid of the two blowers. 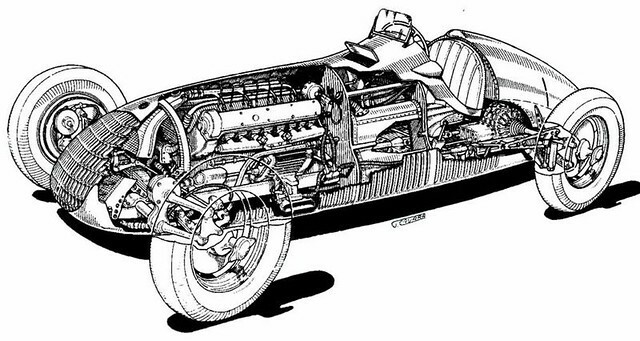 Independent front suspension and a modified De Dion layout supported the rear transaxle with a five forward speed gearbox. Chassis was tubular. With a WB of 255 cm and a track of 132, the three-seater had a streamlined body and was a clean forerunner of the late sixties sport- prototypes designs. WW II ended T-162 (GP car) and T-163 (street car) development. 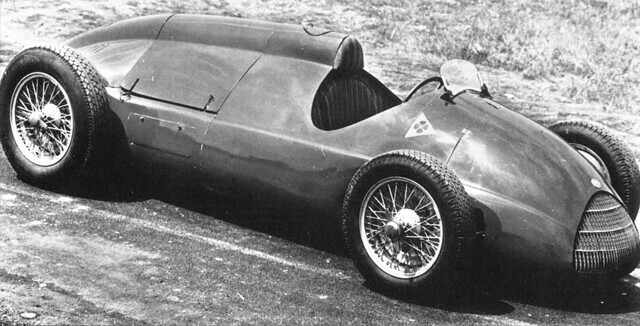 The only Tipo 163, unfinished, was scrapped in early 1950s. You can get some additional info on Alfa Bulletin Board. ** One can argue that the first mid-engine Alfa was designed by Vittorio Jano and built by Jankovits in Fiume as early as in 1935 - see Aerodinamica Spider article.